We use a variety of methodology for hard water stain removal, up to and including mechanical scrubbing of the glass with industry proven chemicals, that will remove your hard water. 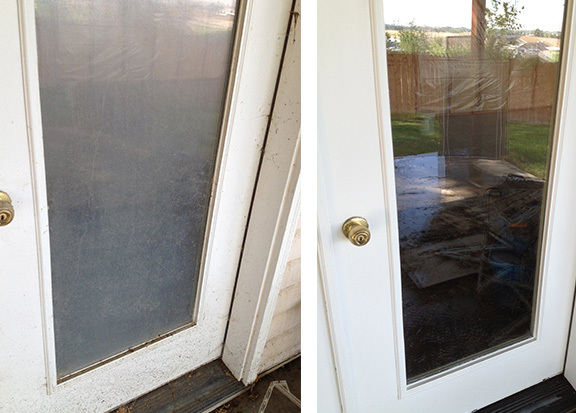 We then offer an application of sealant to protect the glass from recurring spotting. The new industry standard of Nanoultra Hydrophlic Window Technology is a two step process that first cleans and polishes windows back to their original condition, then provides and invisible protection to keep windows cleaner longer. Call us for more information on this or ask your technician when he comes to your home. Float Glass – A commercial method of manufacturing glass in which molten glass is fed into a float bath of molten tin. Laminated Glass – A type of safety glass that has a layer of plastic bonded between layers of glass. Laminated glass is used mainly for windshields. Tempered Glass – A Strong, Break-resistant type of safety glass that, if broken, shatters into small granular pieces. Annealed Glass – Glass that has been heated then cooled to make the glass less brittle. Single-Pane – Windows with just one layer of glass. This type of window offers little protection against heat and cold. Double-Pane Insulated – Windows which have a layer of inert gas sealed between inner and outer pains. The gas that is typically used in this type of window is either argon or krypton. The gas is a poor thermal conductor, so it slows the passage of heat through the glass, eliminating the need for storm windows. Most new windows sold today are dual pane. Triple-Pane Insulated – Windows which seal two layers of gas within three panes of glass. This type of window is generally used in the northern climates and is also installed in homes near highways to help reduce noise. These windows tend to more expensive because of the extra piece of glass, which also makes the sash very thick and heavy. Low-E – Low-E stands for Low-Emissivity coating, which is an invisible layer of metallic oxide that reduces the amount of heat that passes through the glass. The majority of windows sold today offer this type of coating.old.